“I am a mosaic artist and teacher living in Huntington Beach, CA. Living so near the ocean has inspired my work on so many levels and ‘Ammon's Horn’ is one of many explorations into the world below in our oceans we don't always have the opportunity to see. 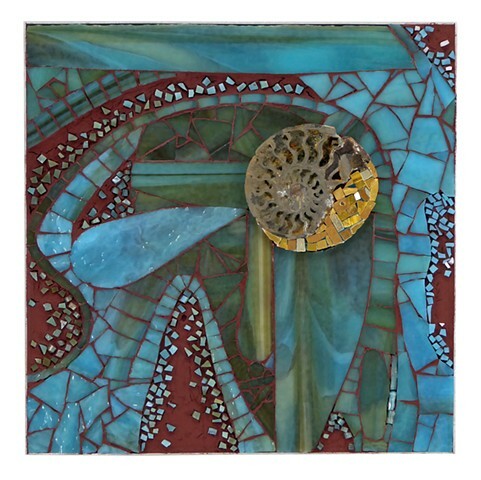 The focal point of this piece is an ammonite fossil. The name ‘ammonite’, from which the scientific term is derived, was inspired by the spiral shape of their fossilized shells, which somewhat resemble tightly coiled rams horns and the Egyptian God Ammon (Amun) was typically depicted wearing ram's horns.